Tolkien’s middle-earth is a land populated by dozens of species of rare animals and supernatural creatures. The mythical Lord of the Rings Monsters serve as a frightening reminder of the presence of the dark forces in the middle-earth, and how their success in conquering it would spell the doom of civilization, and the rule of the forces of darkness over the middle-earth. Goblins (or Orcs) are creatures that live deep underground in the Misty Mountains. They are a race of cruel creatures that live under the earth because they can’t stand the light, which is why they can only go out at night. But in spite of their cruelty and barbarity Goblins are also highly sophisticated and their advanced technology has allowed them to build powerful siege engines and explosives to help them in their conquests. During the War of the Rings the Goblins are some of the best troops in Sauron’s army. This race of giants are incredibly strong and able to withstand the blow of even the sharpest sword. The Trolls strength and resilience in battle is only matched by their major weakness: Sunlight. A Troll that is exposed to the sun will instantly turn into stone. But Trolls are also one of the least intelligent dwellers of the Middle-earth, and although some are able to speak, most only think of eating meat and fighting. Dragons are ancient creatures that have existed ever since the First Age. They can live hundreds of years and thanks to their slow metabolism they can spend decades without having to eat. Dragons are famous for their love of gold – specially if it’s stolen – but contrary to what you may think not all dragons can fly or breathe fire. Some of them have no wings, or even no legs and crawl over the earth like snakes. Dragons who can’t breathe fire are called Cold-drakes and live north of the Grey Mountains . These huge evil wolves are native to the Misty Mountains, and they have been domesticated by the Goblins, who used them as their main form of transportation. Fast, intelligent, and extremely ferocious, the Wargs are well suited to scout and are more than able to fight even in the thick of the battle. However, they are also hard to control and can just as well attack a Human or an Elf, as turn against its Goblin masters or even kill another Warg. Giants are a mysterious race that has lived in the Middle-earth ever since at least the Third Age. There are two kinds of Giants: Stone-giants and Tree-men. Not much is known about this ancient race, but it is possible that in the past they occupied a larger part of the world, though by the time of the events narrated in the Lord of the Rings trilogy they are reduced to living in the North Moors and the Misty Mountains. Fell Beasts are sometimes confused with dragons since they are also able to fly and breathe fire, but they are in fact a different species. Their origin is unknown but they may come from an ancient species, and were bred by the evil Lord Sauron who used them as shock weapons in his army. During the War of the Ring the Witch-King himself went to battle riding an enormous Fell Beast – which was the biggest stead from a group of nine that Sauron gave to the Nazgul. Balrogs are a race of demons that can manipulate fire. They were originally spirits (Maiar) that were seduced into joining the forces of darkness by Melkor before the creation of the world. In addition to manipulating fire, they can also shape-change almost at will, but due to them being spirits they can only be destroyed by a powerful magician. The last known Balrog, Durin’s Bane, was killed by Gandalf in the Battle of the Peak, although it is unknown if other Balrogs lived hidden in other unknown sites or even what happened to Durin’s Bane spirit. 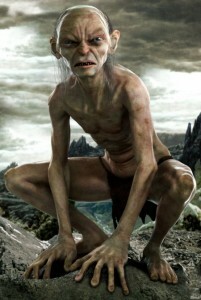 Gollum is one of the few that gets his own category for Lord of the Rings Monsters. This pitiful creature is in the entire series (starting the Hobbit). His despicable obsession with the One Ring is the motivation Frodo has in overcoming the tempting powers of the One Ring.